“No, I’m not,” I say. Surprising myself with my boldness, I retreat behind my father’s knees. I want to be both a city girl and country girl. I am five years old and I know that our family is from dirt roads, country stores, county fairs and a house my great-grandfather built. My uncle still lives in that house, where my favorite piece of decor is the bear head he has mounted in the kitchen; I call it Sweetie. He’s my uncle that flies hang gliders—jumps off mountains, catching wind currents and sailing above mountain ridges for hours at a time. I have another uncle that is a lineman for the power company and goes out in every storm and repairs electrical lines. My other uncle lives in a big city like New York working as a journalist, but still has an accent as tough and Southern as cured ham. His drawl coils around words the way a hand curls around a cup of coffee. As an adult, I occasionally retreat to a memory of my family driving through the winding mountain roads: As we climb to higher elevations, I lie across the back seat of the car and stare at the trees out the window. I see the canopy composed of criss-crossed branches. The leaves look crocheted, connecting in loose patterns but with slack, open space in between. I close my eyes while the sun seeps through the leaves. The shadows come through the window in the pattern of leaves and light, shadowy and sunny across my closed eyes. 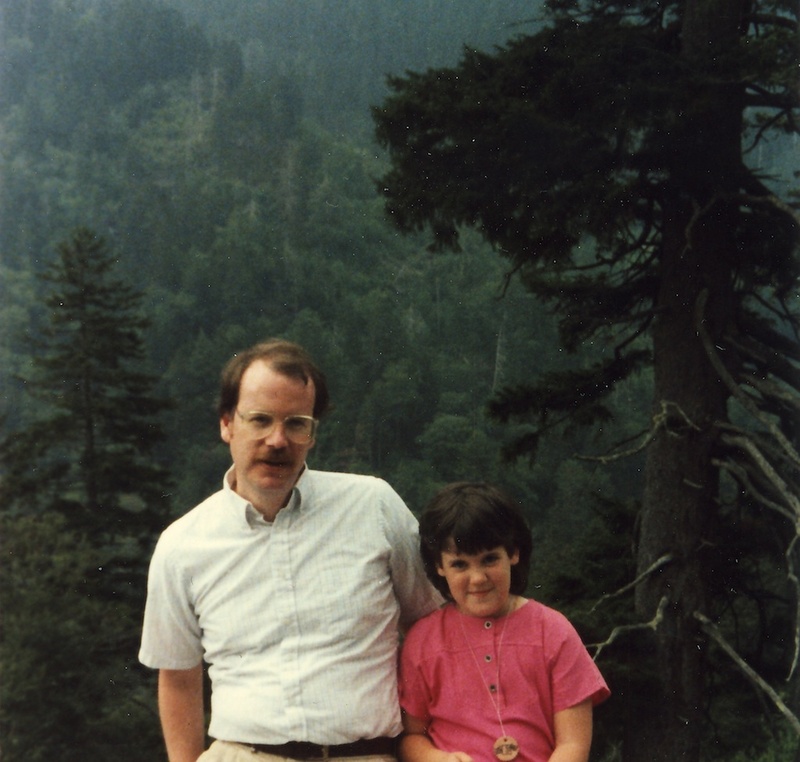 Beth and her father on a visit to Pine Mountain in eastern Kentucky, where she lived from ages 8-14. I have lived in urban suburbs and small, rural towns both. As a small child, growing up in Louisville, bus rides connect my suburban home life to the urban daytime sights. On the bus rides I watch the trees and sidewalks and buildings move past the bus. Inside the bus, I watch shoes—most are tied, some have one untied, some slip on, my own have Velcro. I see hands—ones bigger than mine with wrinkles, like my great-grandmother’s. Other hands are smaller, smooth like mine. I hear voices and laughter from the tall teenage boys in high school. They always stand up in the aisle; they never sit down. They call my mom ma’am. She distracts me from listening to them. I don’t know how long we ride the bus from our bus stop to downtown where my parents work, but my mom and I play “I Spy” using the people and scenes inside the bus as the game board. “I spy something green, do you see what I see?” A t-shirt? A shoelace? One of the boys’ jackets? I go to pre-school downtown where I look different than my friends. I am white, and sometimes kids reach their small black hands to my blondish curls to see how my hair feels between their fingers. During playtime, I take a set of blocks and build a tabletop skyscraper, which to me looks like the very tall downtown building where my dad teaches history classes at the community college. Making a familiar sight out of my toys and pointing out my dad’s classroom high on one of the tip-top floors makes me miss him less during the day. 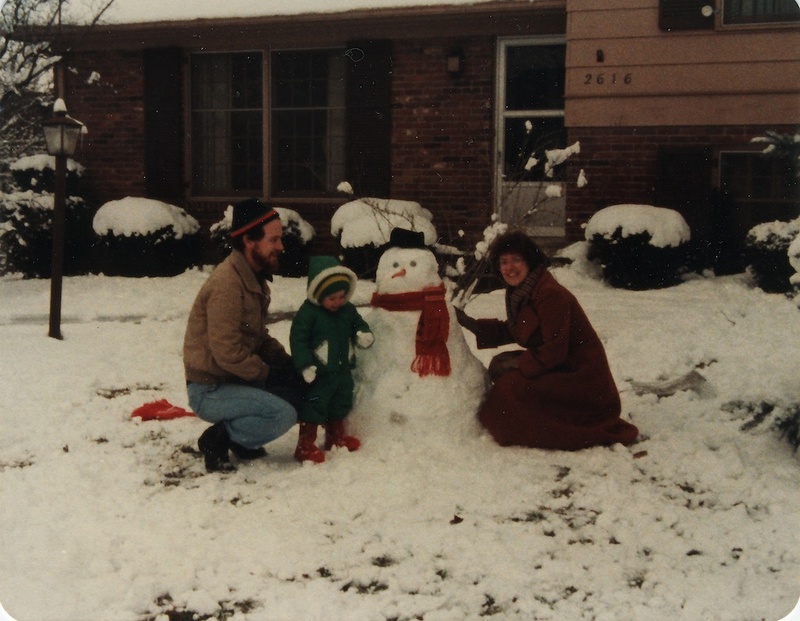 Me, with my parents, at my childhood home in Louisvile. Later, at home on Alsbury Court, I ride my training-wheeled bike on big loops in front of our house—the sparkly streamers on the handlebars blowing back as I pedal forward as fast as I can— my dad keeps an eye on me from the window of his study on the second floor. I feel like I am riding a motorcycle really fast as I take the corners sharply, the training wheels keep me from falling. Decades later as a recent college graduate, I live in Washington, D.C. and the flat, swamp-turned-metropolis provides little familiarity to the bluegrass fields and smaller cities with which I am accustomed. The government buildings and squat office towers spread fat, elongated shadows on the people-filled sidewalks and intersections. The cool pockets of concrete-cast silhouettes fool my body, and perhaps my memory, into feeling like I am walking in a valley at a base of a foothill in eastern Kentucky. I blink, breathing in a fine layer of exhaust fumes and a peppery film of dust instead of the dewy sweetness of the country. I open my eyes, feeling deceived because the comfort I seek is from concrete and steel, not the timber and slope of the mountains. I still feel the tension between city and country and between the Appalachia of my heritage and the urban settings of my adult life. The place where the two experiences meet—between the bricks and the sticks—provokes my imagination. I no longer live in a small mountain town or in the quadrants of D.C. I returned to Louisville some 17 years after my family moved away. I often sit and think on the small back porch of my house. It reminds me of the small, comforting space at my great grandmother’s house in Bristol, Tenn. We would visit her on our trips to the mountains. It was just big enough for two chairs and my great-grandmother and my mom would share a bowl of snap beans to prepare for that evening’s meal. Now my porch faces a small back yard with a good-sized pear tree in the middle. I sit in a pollen-dusted lawn chair and wait for a small breeze to shake the leaves awake. In the summer, I might take a bowl of snap beans I bought from a local farmer and string them and snap them for a supper I will cook in my kitchen. Or I might take my laptop, the clicking of the keys replacing the popping sounds of beans being broken. I sit and smell the barely-cool air of dusk and listen to the faint sound of cars accelerating from a newly-turned green light and the distant freight train crossing the trestle. Beth Newberry is co-publisher of The HillVille. The phrase “bricks and sticks” is taken from the song “My Kentucky Home” by the Villebillies, a Louisville, Kentucky-based band. Love all these juxtapositions, which is what makes us city/country people interesting. Love your writing. I grew up in the small town of Andersonville Tennessee and take comfort when I here someone call me Jimmy. Those folks have known me from my childhood. There is always a longing to go back. Thanks for the beautiful words.